It’s that time of year when pumpkins comes out on the porch, the leaves begin to change, and Halloween—oh wait, it’s still summer and a hundred and eighty degrees outside? Damn the Mad Men of America! Every year Halloween and Christmas jockey for which holiday can get the biggest lead up, and August is barely halfway over and we have pumpkin beer. Whatever, I still love ’em, so let’s get started. Eyes and Nose: This beer comes out peach and amber with a thin white head that dissipates quickly. It settles cloudy, letting in about 40% light. 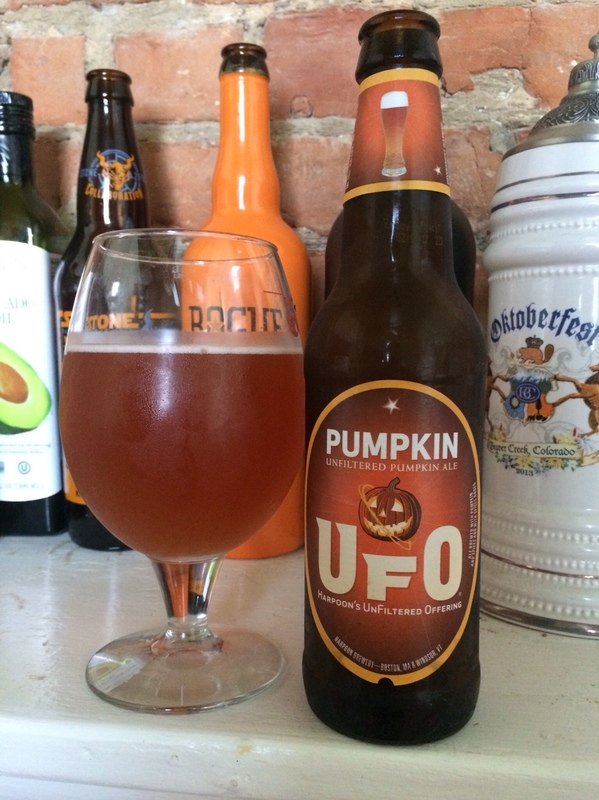 It is an unfiltered beer—hence the UFO (“UnFiltered Offering”). Gourd and orange peel hover in the glass and on the nose with hints of cinnamon. Mouth: The malty nature combined with the cinnamon and clove give this beer a bit of a drier taste, and the bitterness of those spices doubles with the hops. There’s an earthiness throughout and a bit of a refreshing pumpkin and orange sweetness that balances out the beer to an extent. The consistency is pretty light and creamy. It drinks pretty easy with a pumpkin and orange peel flavor that lingers in the back of the mouth. Rating: All in all, this is an alright pumpkin beer. It tastes like a few beets found their way into the batch, perhaps not inappropriate given the harvest theme of a good fall ale. As the first pumpkin ale of the season, it’s not a bad start but there’s room for improvement.